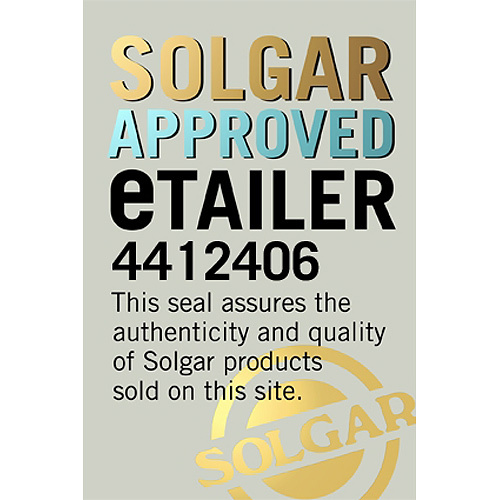 Solgar® Vitamin B12 500 mcg comes in an easy-to-take vegetable capsule form. 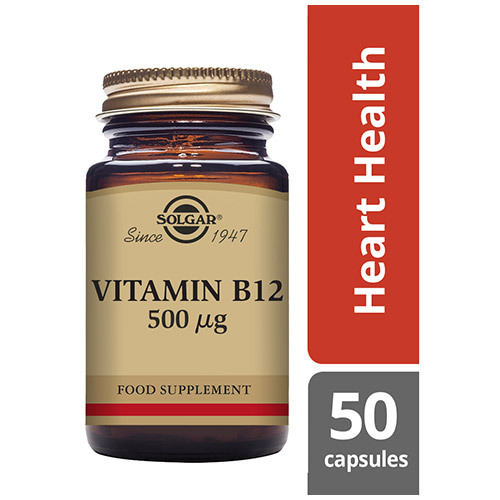 Vitamin B12 also known as cobalamin, is the only vitamin containing cobalt, a trace mineral that is necessary for the formation of red blood cells. It also plays a number of different roles in the body such as reducing tiredness and assisting in the release of energy from foods. 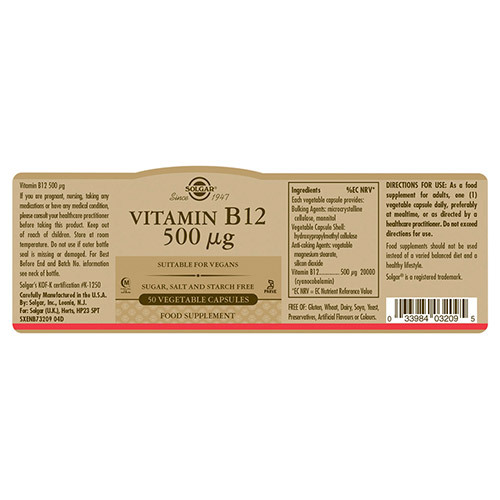 Beyond energy support, Vitamin B12 has several health benefits supporting general wellbeing and vitality such as supporting the immune system, mind balance and the formation of red blood cells. Vitamin B12 is naturally found in fish, dairy products, organ meats, beef, pork, fortified foods and is a water-soluble vitamin. With meat being the richest source of vitamin B12, a daily supplementation is often recommended for Vegans and Vegetarians. Bulking Agents: microcrystalline cellulose, mannitol, Vegetable Capsule Shell: hypromellose, Anti-caking Agents: vegetable magnesium stearate, silicon dioxide. Free from: gluten, wheat, dairy, soy, yeast, preservatives, artificial flavours and colours. As a food supplement for adults, take 1 vegetable capsule daily, preferably at mealtime, or as directed by a healthcare practitioner. Do not exceed directions for use. Below are reviews of Solgar Vitamin B12 - 50 x 500mcg Vegicaps by bodykind customers. If you have tried this product we'd love to hear what you think so please leave a review. 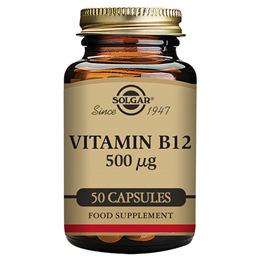 Solgar® Vitamin B12 500 mcg comes in an easy-to-take vegetable capsule form. Vitamin B12 also known as cobalamin, is the only vitamin containing cobalt, a trace mineral that is necessary for the formation of red blood cells.